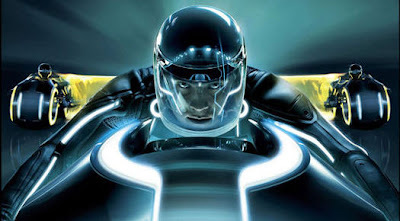 Joseph Kosinski told MTV that "Tron Legacy" will be 98% 3D. He said, "Our approach is not like "Avatar," which I think is 3-D from the first shot to the last. Ours is sort of a "Wizard of Oz" approach. Ninety-eight percent of the 3-D is in the world of "Tron." The 3-D really starts once we get into the Tron world." Kosinski also explained that the 'Legacy' combines digital motion capture and a similiar live-action camera that was used for Avatar. He said, "It's a combination of technologies that Zemeckis has been using in terms of the completely digital motion-capture of a character and for the live-action camera system. We used a camera developed by James Cameron's company. We used a newer generation of camera than the one used on "Avatar." They built it specifically for us." Head over to MTV to read the rest of Kosinski's interview where he talks more in depth about Jeff Bridges part in the sequel, some scenes that might be adjusted for the IMAX release and his reasons for hiring Daft Punk as composers for the film.